The Baptist Peace Fellowship aims to provide a fellowship for Baptists who find that the use of military force cannot be reconciled with the teaching of Jesus Christ and His acceptance of the Cross. We ally ourselves with those who seek nonviolent means to confront and overcome injustice and so work at all times for the things that make for peace in national, community, church and personal life. We do not believe that we have all the answers but will be led to witness in ways appropriate to the conditions in which we find ourselves. We aim to engage with our fellow Baptists on these issues so that they may come to see that armed conflict does not lead to long term peace. Like the early Christians we endeavour to talk to those whom we meet about the good news of the gospel of the Prince of Peace. Please take some time to find out more about us by clicking on the links above. There is a prayer request from a Peace Accompanier which can be viewed here. 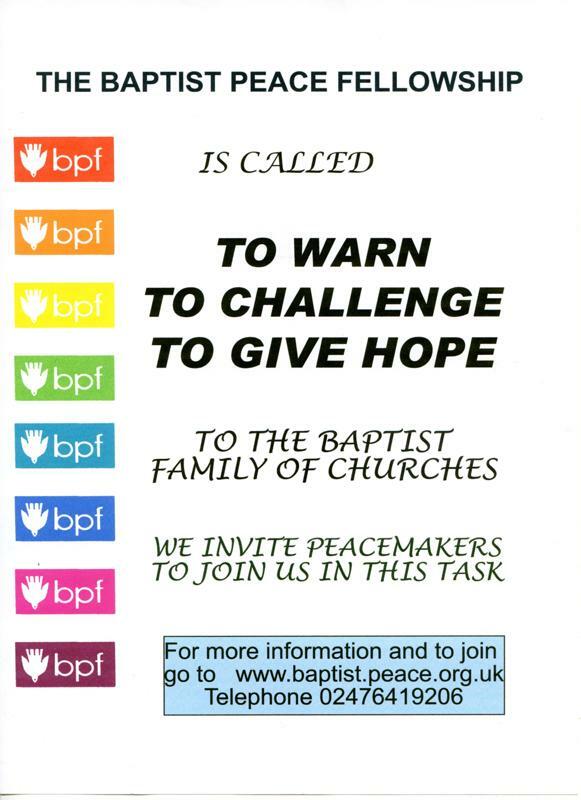 Associate membership of the Baptist Peace Fellowship is open to those who have a broad sympathy with the Covenant and who share our concern for issues of peace and justice. Associate members receive our mailings. We have no set subscription but our work is often limited by our finances. Members may make a donation to our funds and any contributions will be gladly received by the Treasurer! Regular giving helps us to plan ahead - we can send you a Standing Order Form. £10 a year is a suggested sum. Details of vigils and actions for peace at centres all over Britain can be found at www.quaker.org.uk. The publication of literature relevant to Baptists and Peacemaking. The organisation of meetings and conferences. We are willing to talk to groups in churches. The raising of issues of justice and peace at the Annual Assembly or through the Council of the Baptist Union. Issues are also aired through the columns of the Baptist Times. 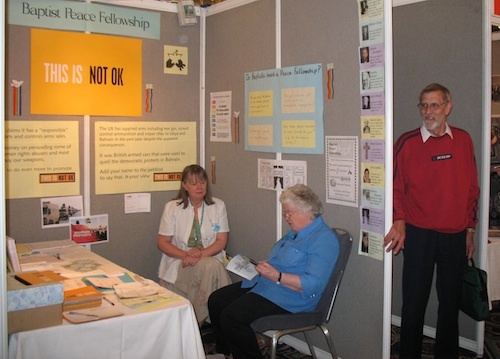 Working with other Christian Peace Groups through the Network of Christian Peace Organisations. We are affiliated to the Campaign against the Arms Trade and the Fellowship of Reconciliation. Many of our members attend peace demonstrations and draw attention to peace issues through writing letters to M.P.s and Government. Click here to download a list of books and other resources. A poster publicising the work of the Fellowship can be obtained here. Spring 2014 Newsletter (WW1 special). 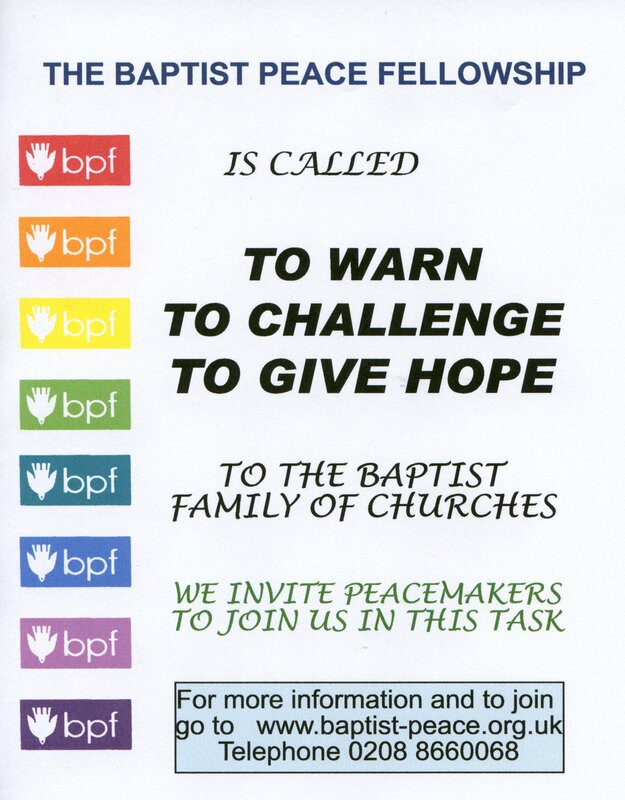 Baptists as Peacemakers by David Coffey OBE. Statement on Trident by the Joint Public Issues Team. Some while ago the Baptist Peace Fellowship committee had a discussion on whether Remembrance Sunday services were still relevant and, having come to a majority decision that indeed they were, the idea of a pack of resources was pursued. This began in 1998 and we have continued to add to and amend its contents since then. No attempt has been made to produce sermon outlines nor service orders, but there are prayers, readings, meditations, material for children and hymns along with personal reflections which may inspire the reader to pursue the ideas and thoughts further for themselves.